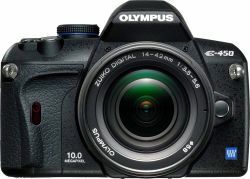 Photography Blog has reviewed the Olympus E-450 DSLR camera. This Olympus camera is a slightly improved version of the Olympus E-420 and it is one of smallest DSLR cameras on the marked. Photography Blog ends up giving the Olympus E-450 a “Recommended” rating as you get a lot of features in this entry-level camera. The camera delivers pictures of high quality, but lacks a few things like image stabilization and video mode. Overall this DSLR camera from Olympus seems great if you are looking for a compact camera. Read the full review of the Olympus E-450 DSLR camera here.